OT Mom Activity Updates is a free, occasional newsletter to support parents, teachers and occupational therapists! When I have fresh activity ideas, exciting new pages, significantly updated pages or in-depth answers to a question posed to me, I will share them in a newsletter that comes directly to your inbox. From time to time, I will also give readers of my newsletters exclusive discounts on my e-books, as well as any discounts passed onto me from suppliers. OT Mom Activity Updates will only be sent out when I have original and important information to share, so it may not be as regular as some ezines sent out by big companies, but it definitely won’t be mindless filler clogging up your inbox! Sign up now using the form below if you want to be the first to read new OT Mom pages, get fresh activity ideas and access my special discounts when they happen! I understand that you will use my information to send me the OT Mom Activity Updates Newsletter. I understand that I can unsubscribe at any time by clicking the unsubscribe link at the bottom of any email. 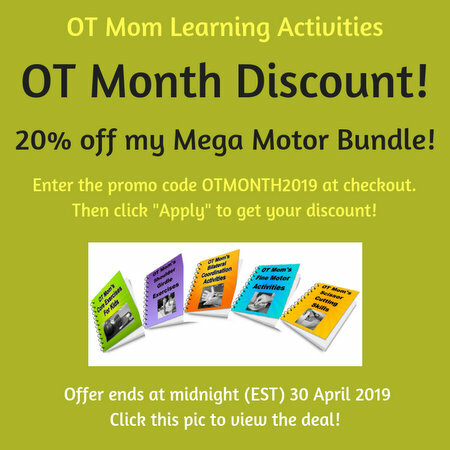 Subscribe to OT Mom Activity Updates! I'm looking forward to being in touch with you!